Traveling to India is an exciting adventure! What’s not exciting is getting there and realizing you have the wrong visa or don’t understand the conditions of the visa. We’ve outlined what you need to know in order to find the right visa for your trip, how to get your visa, what to do once you arrive in India and how to read your visa. Non-refundable tickets or reservations should not be purchased until all visas and passports are secured and in your possession. Although it has gotten better, the visa application process is notorious for not being on time. Visas are valid from the day the visa is issued, not from the day of your entry to India – so don’t apply too early! The most common visa is a Tourist Visa (lasts 6 months). The former rule that a period of 2 months must elapse after leaving India and before re-entering has been removed since November 2012. If you want to study yoga for longer than 6 months then you must apply for a Student Visa. Some people call this a “Yoga Visa” but its technical term is “Student Visa”. Not all yoga centers are approved for Student Visas and the center must provide some of the documentation for you. See “Student Visa” below for more information. A visa is an official authorization that permits you to enter and travel within a particular country. They are attached or stamped into your passport. The most common types of visas are: Tourist, Business, Residence or Student Visas. You must follow the guidelines given by the country you want to visit when applying for the appropriate visa. Who needs a visa for India? Everyone (including children), except for Nepalese and Bhutanese nationals, require a visa for India. What type of visa to study yoga in India? In the past you could study yoga just on a Tourist Visa, and in most cases you still can, but recently some officials (especially in Mysore) require you to have a Student Visa. If you know where you want to study, you can contact the yoga center and they should be able to tell you which visa(s) are accepted for their courses. If you are going to India to travel or study yoga for a short amount of time (6 months or less) then you will need a Tourist Visa. These are valid only for tourism. Holders are prohibited from employment within India. See below for more details on Tourist Visas. If you are going to India to study yoga for an extended amount of time (6 months or more) or at an officially recognized educational institution then you will need a Student Visa. Some people use the term “Yoga Visa” but it is actually a Student Visa. One of the most important documents you will need for a Student Visa is a letter from the school affirming that you are signed up for their course. See below for more details on Student Visas. If you are going to India to do volunteer work at an ashram or to work with any other group such as an NGO, then you will need an Employment Visa. In the past you could enter on an “X Entry Visa” however this is no longer accepted for volunteer work. Similar to a Student Visa you will also need a letter from the place where you will be volunteering. For all other visa types including Business, Employment, Journalist, Transit or Entry “X” Visa, please see the website of the Indian Embassyin your country for more information. Tourist Visas are generally valid for 6 months and are single or multiple-entry. Single Entry: If you are on a single entry tourist visa, you can only enter the country once and stay for a maximum of six months. After six months, you must leave India and apply for a new visa in order to return to India. If you leave India at any point during your 6 months you cannot return to India. Multiple Entry: With a multiple-entry tourist visa, you can leave India, and re-enter without having to obtain a new visa as many times as you like during the period of validity (see “Duration” below for more details). Like the single entry visa the longest duration you can stay at one time is 6 months. Most Indian tourist visas are valid for 6 months, however some nationalities are only granted 3 months. 5-year and 10-year tourist visas are available to US citizens under a special bilateral arrangement. The maximum stay on any tourist visa is always 6 months (180 days) during each visit. They are very strict on this rule. You could face detention and significant penalties if you remain in India beyond the validity of your visa. Please check with the Indian Embassy in your country for the most up to date information on each of these requirements or others that may not be listed here. Passport valid for at least six more months from the date you plan to be in India and with at least one empty page (sometimes two pages – USA). Please note: The Indian Embassy does not require any specific vaccinations in order to obtain a visa to India. Nevertheless, you should check with your doctor about suggested vaccinations. If you are planning to study yoga in India for longer than 6 months (180 days) and will be studying at an officially recognized educational institution or in Mysore, then you will need a Student Visa. In India the authorities and yoga schools use the term “Yoga Visa” but this is not a term used by any visa service center or embassy where you will obtain your visa – they only recognize “Student Visa”. Your Student Visa will last the duration of your yoga program which can be up to 5 years and can be extended while in India. For more information you may download the FAQ about Student Visas (PDF – 12KB) from the Indian Ministry of Home Affairs. Tourist Visas cannot be extended within India except in an emergency. In an emergency situation, you can obtain a 15-day extension by presenting your return flight ticket to the nearest FRO (Foreigners’ Registration Office) or FRRO (Foreigners’ Regional Registration Office). Other visas can be extended by submitting your request to the FRO office. Please note: extensions for Tourist Visas are very very rare. Exceptions are for cases like: you got in an accident or are extremely sick and cannot leave. Tourist visas CANNOT be converted into any other type of visa while in India. You must leave India to apply for a different visa. For all other visas, if you need to apply for a conversion, you can do so through the Ministry of Home Affairs (MHA) in Delhi, or through an FRO who will then forward your case to the MHA. Otherwise, you must leave India and apply for the new type of visa. 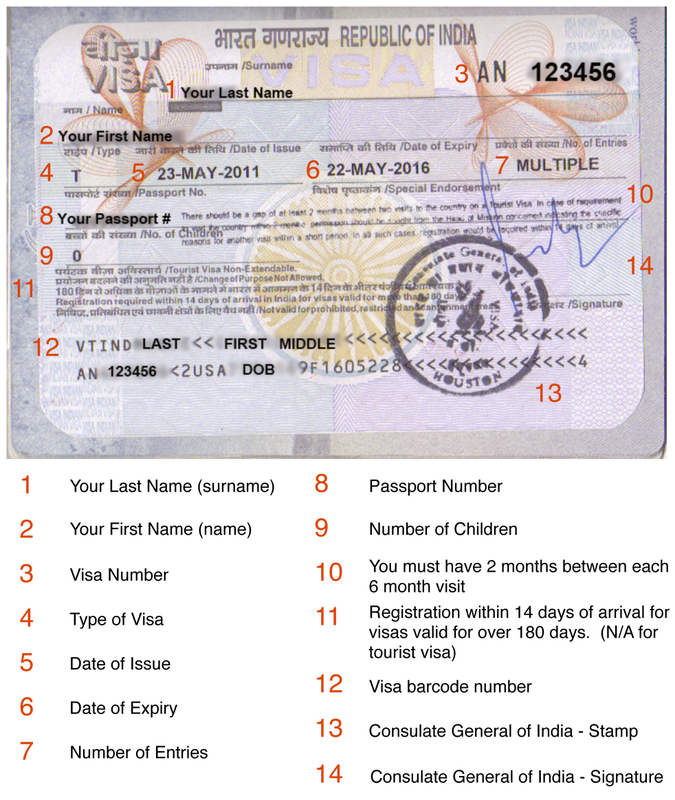 All visas are valid from the date of issue, not the date of entry into India. For example, a 6-month Tourist Visa issued on January 1 would be valid until June 30. Application forms will normally request that you name at least one referee in India. If you know where you will be studying yoga then you can put the center or if you are traveling you can simply put the name of the hotel where you will be staying. Tourist visas can sometimes be obtained on the same day or take up to 10 days, other visas may take longer. For a Tourist Visa, give yourself at least 7-10 days to avoid any unexpected delays. Obviously you will obtain your visa quicker if you have all your documents prepared beforehand. If you are not residing in the country of your citizenship when applying for a visa, then you must contact the Indian embassy or appropriate office in the country where you are residing for more information on obtaining a visa. All types of visas EXCEPT Tourist Visas and Transit Visas can be extended within India. The MHA in Delhi or a FRO/FRRO has the power to extend a visa. Please note: while some types of visas can be extended within India, the process is very tedious and should be avoided whenever possible. Therefore, try to get a visa that will cover the entire period you want to stay. If you are on a Tourist Visa you will NOT have to register in India, but if you are on a Student Visa or other visa you will. All foreigners (except children under 16) who will stay more than 180 days in India are required to register with the FRO/FRRO within 14 days of arrival. Since 2010 citizens of Finland, Japan, Luxembourg, New Zealand, Singapore, Cambodia, Indonesia, Vietnam, the Philippines, Laos and Myanmar can be granted visas-on-arrival in India. This visa is valid for 30 days, for a single entry only and it cannot be converted to any other kind of visa during the stay in India (except in exceptional circumstances). The fee is US$60 per person (including children) and is available at the following airports: Delhi, Mumbai, Chennai and Kolkata. For more information about Indian visas, please visit the website of the Bureau of Immigration, Minister of Home Affairs. hi. my name is laleh. i want to take admission for my brother to come from iran as a student visa for yoga and i am living in bangalore . so i want to know which univesity i need to go in bangalore to ask about it? I’m planning to come to India to volunteer in Auroville for 2 months & then study yoga in Mysore for 3 months. Studying in Mysore requires a student visa but then what about volunteering?? PLEASE HELP! Hi Gabrielle, contact your local Indian consulate or embassy for advice. Thank you for putting all this info out …. I am in India on a 3 month X entry visa for yoga …. can this be extended for another 3 months!! Note that I hold a travel document for refuges “Stateless” . We are not experts in Indian visa (also not allowed to advice) and your case is special – you have to clarify with the Indian authorities in India. All the best for this, in yoga! Hi I staying in India now with student visa I like to travel in India and my visa would expire in July 7 I like to know how can I extend it and get permission to travel in India…. Hope this helps. Enjoy your study and stay in India. in most cases, you cant extend the visa unless you leave the country. my suggestion is to take a small break, go to nepal or sri lanka and apply fresh visit visa if you want to travel in india. we welcome you to visit kevala foundation, a sacred energy shiva shakti center in chikmagalur. Thanks for making the distinction between yoga visa and student visa. It is great to know the latter can be extended up to 5 years.